There will always be days when everyone remembers exactly what they were doing at a certain time because something momentous happened. 9-11 is one of those days. The day that John F. Kennedy was shot is another. And for those who were living in the Midwest in the fall of 1940, November 11, Armistice Day (now known as Veteran’s Day), was one they never forgot. Because that was when they were blindsided by the disastrous Armistice Day Blizzard. My mother, Nina Ostrom, was one of them. Nina, then a 19-year-old college student living in St. Paul, Minnesota, would recall years later that the sun was bright that morning and temperatures had actually eked their way into the high 50s – amazing for that time of the year. She decided to use the holiday to squeeze in some extra studying at the college library, so she pulled on a skirt and blouse, bobby socks, saddle shoes and a calf-length wool coat – certainly a warm enough outfit for that kind of a day. The weather forecast, which the morning paper said was “cloudy, [with] occasional snow, and colder, much colder,” gave no hint of big trouble ahead. Once Nina got to the library and settled in, she became so engrossed in her trigonometry problems that she barely noticed several hours had slipped by and rain had set in. By the time she looked up from her books, the rain had turned to heavy snow, ice was being hurled to and fro by howling, gale force winds, and the temperature had plummeted to well below freezing. When she cautiously opened the library door and peered outside, she was stunned by a blast of freezing wind and a mass of white, swirling snow that obscured virtually everything. A blizzard! Nina slammed the door and wondered what to do. There were no phones available, and even if she could contact her parents or her boyfriend Lyndon, it wouldn’t do her any good. Nobody had a car. Completely out of options, she decided to button up her coat, pull her books close to her chest, and brave the half-hour walk home straight through the blizzard. Using the trees that lined the street to keep her on the straight and narrow, Nina slowly began to plow her way through the disorienting, blinding whiteness. Fighting against the driving wind quickly left her exhausted and she had trouble catching her breath, but there was nothing to do but forge ahead. It was certainly no half-hour walk home that day, and with her light clothes and no stockings, Nina was literally freezing. Finally, after what seemed like eternity, she thought she spotted her house up ahead, with the streetlight in the front yard barely glowing through the whiteness. Yes, there was her father, standing out on the front porch despite the high winds and subzero temperatures, anxiously looking up the street for his daughter. When he caught sight of Nina, he sprinted down the front steps and ran through the whirling snow, grabbing her and hustling her into the house. Later he would say, aghast, “There she was, walking through a blizzard with no stockings on!” But the relief he felt once his daughter was safely out of the storm was so extreme that he had to lie down for the rest of the evening. At the time, no one realized how lucky Nina had been. The Armistice Day Blizzard of 1940 ranks number two of the top five weather events in Minnesota during the 20th century. Cutting a 1,000 mile wide path across the Midwest, the blizzard killed 154 people. In Minnesota alone, 49 people died, many of them motorists who froze to death when huge snowdrifts left them stranded in their cars. In some areas, over two feet of snow fell in just 24 hours. It’s nothing short of a miracle that Nina didn’t get lost in the storm and that her bare legs weren’t frostbitten. Someone was definitely watching out for her that day. 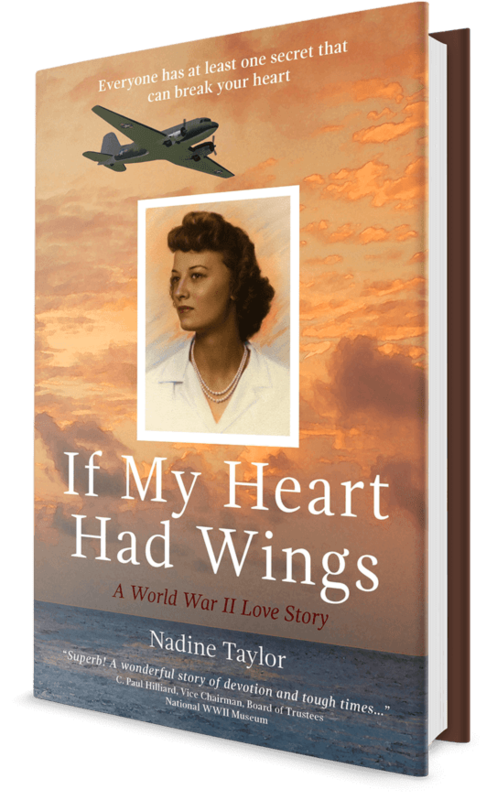 In early 1943, USAAF transport pilot Lyndon Raff, the hero of If My Heart Had Wings, finished his training and found himself whisked off to northern India. His assignment: flying the Hump, that is, piloting a slow clunky C-47 transport plane loaded to the max with gasoline, food supplies, ammunition and sometimes even bombs, straight over the Himalayas (the Hump) to China. What was the point of this crazy, dangerous assignment? The year before, in 1942, Japan had successfully cut off every single supply route to China and was systematically starving the Chinese out. Once China fell, Japan was ready to scoop up Chinese wealth, natural resources and troops, which would make it almost impossible to beat in the war in the Pacific. Thus, a major Allied priority had become keeping China strong. Since the only remaining way to get supplies to the Chinese was by air, that task fell to the USAAF. To this day, flying the Hump flying is considered the most dangerous assignment ever given to air transport personnel, and with good reason. Winds roared up and down the sides of the Himalayas at speeds of 100 – 200 mph, causing fierce turbulence that could shoot a plane straight upward one minute and down the next, or even flip it over. Because radio and navigation tools didn’t work in mountainous areas, Hump pilots had to “eyeball” their way around the peaks, relying solely on landmarks. But when massive cloud formations settled in, which was often, the pilots were flying blind. Taking the plane above the clouds wasn’t an option because ice would form on the plane’s exterior that could cause sudden drops of 1,000 feet or more, or even worse, send the plane into a nose dive. Another big problem was the sudden appearance of Japanese Zero fighter planes. The Zeros were twice as fast and much more agile than the clunky transports, so the Hump fliers’ only choice would be to duck into nearby cloud cover, if there was any, and hope they didn’t run into the side of a mountain. As for Lyndon Raff, in spite of all of these challenges, he managed to fly his C-47 over the Hump and back again at least eighteen times. Eventually, he was transferred to another supposedly safer assignment. Unfortunately, it would seal his doom. World War II ended more than 70 years ago, but according to a 2010 study, it may have hastened the deaths of some of its veterans decades later. 1) Those who had participated in combat were nearly 30 percent more likely to have died by 2000 than those who hadn’t seen combat. 2) Those who had served overseas were over 50 percent more likely to have died by the year 2000 than those who served on the home front. 3) Those who had served in the Pacific theater were 50 percent more likely to have died by 2000 than those who had served overseas in other theaters. It’s interesting to note that serving on active duty didn’t increase or decrease the mortality risk of WWII veterans compared to civilians, so it wasn’t just being in the military that shortened their lifespans. Why did veterans who had seen combat, served overseas, and/or served in the Pacific theater have shorter lifespans than their counterparts? Most likely it had to do with intense stress they suffered. Combat, of course, is incredibly stressful. As so is being overseas, far from family and familiar situations, with no way to get home even for a short leave. As for serving in the Pacific theatre, some of the bloodiest and most brutal fighting of WWII occurred there in extremely rugged environments. Making matters worse, since the majority of the war effort was directed toward Europe, less support was given to those sweltering in the jungles of the South Pacific. The study found two other factors that appeared to play a role in the veterans’ length of life: heavy drinking, a factor known to decrease the lifespan, and higher education levels, which apparently increases it. My own father, Jay Taylor, a WWII Army officer, is an archetypal example of a WWII serviceman with a shortened lifespan. He served overseas in the Pacific theater (New Guinea and the Philippines) and participated in combat multiple times. His education was modest (high school only) and he became a heavy drinker not long after he came home, a habit he never gave up. He died of lung cancer at age 70 in 1988, some twelve years earlier than the benchmark year of 2000 used in this study. This, of course, begs the question: Did my father’s life end sooner than it should have because of what he did in the war? That’s something we’ll never know for sure. Rosie the Riveter was a tough yet feminine American poster character helping to win World War II by doing a “man’s work” in a factory. Her gorgeous face, well-developed biceps, and insistence that “We Can Do It!” perfectly blended femininity and male resolve. It wasn’t long before the idea of “working like a man” took hold among 1940s women nationwide. Part of a government propaganda campaign, Rosie the Riveter was designed to encourage women to fill the huge labor gap left by American men off fighting World War II. Jobs always been considered exclusively “male,” like driving trucks, welding, riveting, and working in factories and shipyards, were suddenly wide open, and it was essential to the war effort that women take them on. Still a certain amount of resistance lingered on the part of both sexes. After all, wasn’t a woman’s place in the home? Someone had to get women to understand that setting aside 1940s gender roles and doing a “man’s work” was not just okay but patriotic. The government’s Rosie the Riveter campaign filled the bill brilliantly. Between 1940 and 1945, some five million U.S. women joined the workforce, many of whom had never held a job before. But when the war ended in 1945, returning U.S. soldiers wanted “normalcy.” They wanted their former jobs back, and wanted their wives to go back to traditional domestic roles: cleaning, cooking, and caring for the children. Women who continued to work were pressured to give up their jobs in favor of men and quietly disappear into their homes Some even got an extra push when their employers fired them. Although females continued to make up about one-third of the post-war labor force, they certainly weren’t celebrated or encouraged. As for Rosie the Riveter, because she was no longer necessary and promoted a message that ran contrary to male sentiments, she quickly faded into oblivion. But the genie she’d let out of the bottle would never completely return. Women had proven they could successfully handle a “man’s work,” and the breakdown of gender stereotypes had begun.